History, politics and economics are brought to life in the exciting context of Russia and Eastern Europe, and combine some of the most important approaches for understanding the social, cultural, economic and political world around us. Students on this programme will develop skills essential for a wide range of future careers and activities. A total of 18 points in three higher level subjects, preferably including Mathematics, with no score below 5. A total of 17 points in three higher level subjects, preferably including Mathematics, with no score below 5. D3,D3,D3 in three Cambridge Pre-U Principal Subjects. Mathematics preferred. AAA at Advanced Highers (or AA at Advanced Higher and AAA at Higher), preferably including Mathematics at Advanced Higher. This degree programme gives you the opportunity to combine insights from three different subjects. It further provides ample scope for specialisation in topics that are of interest to you. 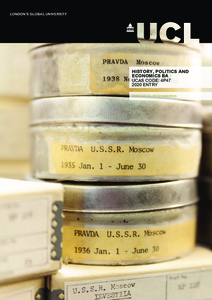 The UCL School of Slavonic & East European Studies is the largest national centre in the UK for the study of Central and Eastern Europe, Russia and the post-Soviet countries. The SSEES Library contains over 400,000 books, journals and film resources. Our staff are active in research and consultancy at the frontiers of their subjects. Your teaching will draw on their comprehensive knowledge. The History, Politics and Economics BA is carefully structured to give all students a solid foundation in each of the three subject pathways, while promoting increasing specialisation as the degree progresses. Students will choose two specialist disciplines in year two and one specialist discipline in the final year, including a research dissertation. This programme structure enables students to tailor their studies to their evolving interests, while also encouraging them to explore the interface between history, economics and politics in years two and three. The programme will involve the acquisition of knowledge concerning the histories, economies and societies of the wider European region. It will do so with particular reference to Central and Eastern Europe, Russia and the post-Soviet world. By seeking to understand this area from the vantage point of its global interconnectedness and significance, this programme will foster perspectives which are global in their reach. Other History, Politics, or Economics modules offered within SSEES. Subject to approval, credit may be taken in another UCL department. At the end of year one students select two specialist tracks. You will select 2.0 credits from a wide range of module options, including a language if studied in a previous year. 1.0 credit must be related to your dissertation. You will be taught via a combination of interactive lectures and small-group tutorials. Tutorials will involve discussion, exercises, presentations and experiments. You will be set regular written work, including essays, policy analyses, exercises, online activities and posters. Your assessment will be based on various types of written coursework, presentations, some unseen written examinations, and a final-year 10,000-word dissertation. Throughout the programme you will receive detailed feedback to help you develop your skills. For the dissertation you will have an individual supervisor to provide support and advice. We expect graduates of this degree to have a multitude of transferable skills, combined with specialist knowledge of the region. This degree might lead to careers in government service (UK and other EU states), international agencies and non-governmental organisations (NGOs), consultancy (economic, political risk, security, marketing), banking, financial services, law, media, teaching and the leisure industry, as well as to further study. We use your qualifications, predicted grades and personal statement to assess your suitability for this programme. Your personal statement should explain your motivation for applying for this multidisciplinary programme. It should also provide evidence of your interest in history, politics and economics in the context of Russia, the former Soviet Union and in Central and Eastern Europe. On the basis of our assessment of your application we will decide whether to make you an offer and if you are successful you will be invited to a post-offer open day (if you live in the UK). The open day will include introductory talks providing more information about your chosen degree programme, the department, and our facilities and services. You will also have the opportunity to ask questions and to go on a tour of UCL led by current students.